This is the first full novel written by Kyle Mills under Vince Flynn’s banner (I believe Mr. Mills helped finish the last novel as Mr. Flynn fought cancer). I wasn’t sure what to expect and I am not sure that Mitch Rapp is quite the same as he was when Vince Flynn was the writer. Perhaps I am looking too deep, but this Rapp is a bit edgier; if that can be possible. Let me know when you read the part in Pakistan and the ISIS prisoner. In Order to Kill, Mitch Rapp’s team find themselves up against, not overwhelming forces (okay they face that too), but an enemy as well trained and deadly…perhaps even a match for Mitch himself. The world is in turmoil and old enemies become desperate and then bold and then deadly. When the instability in Pakistan threatens the world peace, Rapp and the CIA need to find the person behind the plot and stop it before it tears the global economy apart. Keeping my earlier comments in mind, Order To Kill was an extremely exciting novel to read. An “edge-of-my-seat” book as I have come to expect…and ENJOY…from the Mitch Rapp series. While there may be slight differences with Mr. Mills as the author, one difference is not quality. I look forward to the next novel! This article was published on Nov 15, 2016 . 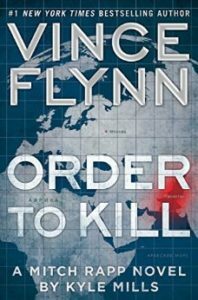 It is tagged kyle mills, mitch rapp, order to kill, vince flynn. You can follow any responses to this article through the comment RSS feed.